The changes will be available via the Windows 10 Mail and Calendar app, meaning Gmail users won't see them outside of a Windows 10 device. 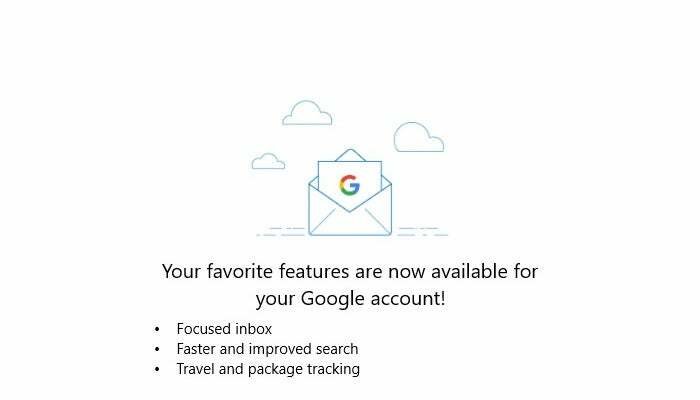 Soon Gmail accounts will no longer be second-class citizens in Windows 10. Microsoft announced late last week that some of the company's top features for Outlook.com and other Microsoft-hosted email are coming to Gmail accounts. The changes will be available via the Windows 10 Mail and Calendar app, meaning Gmail users won't see them outside of a Windows 10 device. The added features include Focused Inbox, and travel and package tracking. Microsoft also says it will extend "faster and improved search" to Gmail via the Mail app. Microsoft's alert to Gmail users in Windows 10 Mail. The new features are rolling out over the next few weeks to Windows Insiders for testing. Microsoft did not provide a timeline for when mainstream users might see the new features. Some would argue that Inbox by Gmail offers a similar filtering ability. Inbox by Gmail uses a dramatically different interface from Gmail, however, while Focused Inbox is just a filtered version of your regular inbox, making it easier to adapt to the feature. Microsoft says users will have to authorize Microsoft to sync their email, calendar, and contacts to Microsoft's cloud to use the new features. It appears Microsoft will ask users if they want to use the new features at least twice. 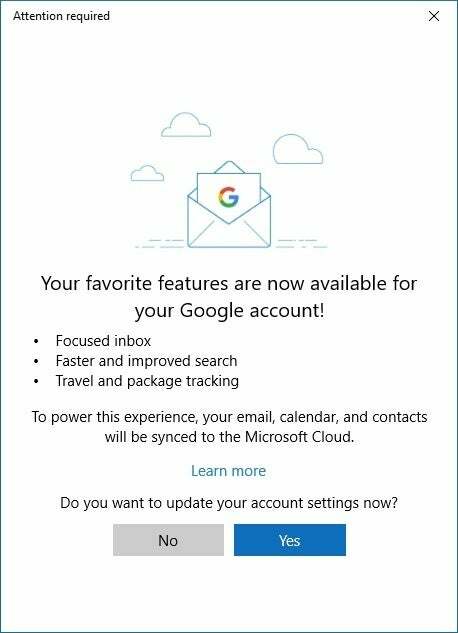 "You’ll know the new experience is available for your account when you are prompted to update your Gmail account settings," Microsoft said in a blog post. "If you miss the first prompt, we will remind you again in a few weeks." Hopefully the company won't perpetually badger people to authorize the new feature if they decide against it. The story behind the story: The fact that Gmail users won't see the new features in non-Microsoft apps or when using Gmail.com may not be such a huge loss. Gmail already has fantastic search capabilities on its own, and travel and package tracking has been a standard part of Gmail for years. The only advantage Microsoft offers is Focused Inbox, which does an excellent job of filtering out the cruft to deliver the most important messages to your inbox.